Writing is more like learning a musical instrument like the violin or the bassoon than learning a subject like calculus or biology. Writers, like musicians, are born with varying degrees of natural ability. Some are born with a gift for words, just like some are born with perfect pitch and a sense of rhythm. But no matter how innately talented, every writer can improve through practice. The average American high school graduate writes poorly not because he is less talented or intelligent than those in previous generations, but because he hasn’t written enough. No one expects to become a bassoon virtuoso after a handful of lessons and a practice or two. The same goes for writers. Students in WriteAtHome courses are typically asked to submit one draft of a paper per week. We think that’s a good starting place for the average student — sort of the bare minimum. It’s our hope that most students are doing more writing than that in the course of their daily studies. It’s just common sense: the more practice you get putting words on a page, the more your skills will develop. There’s obvious value in putting in the practice, but for students to really get the most out of their writing experiences, they need helpful feedback from someone who knows their stuff. Students who fill notebooks of diaries but never allow critical eyes to read them tend to just reinforce bad habits. But students with capable and inspiring teachers who read and respond to their writing see the best results. The music analogy works here too. If you wanted to teach a child to play the bassoon, you wouldn’t just sit him down in his room with the instrument and tell him to practice until it starts to sound good. You’d find a music teacher. Someone with skills. Someone who loves both music and kids. And your child would play for his teacher once a week or so. The teacher would watch and listen, correct and encourage, demonstrate and instruct. That’s what WriteAtHome writing coaches d0 too. They love writing, they love kids, and they have developed strategies for helping student writers by responding to their weekly writing assignments. The success of our program is due to the fantastic people we have working with young writers. The idea of emphasizing writing as a process has been around for decades. It’s one of those things young writers tend to struggle with, but the truth is that good writing doesn’t pop out of the brain on demand. Even the best professional writers know that a first draft is just a beginning. Getting it right means preparing yourself, cranking out a rough draft, then working and reworking it until it’s just right. Writing well takes time. I remember turning in papers to English teachers in high school. A week or two later I’d get it back with a grade in the corner and lots of red ink notes in the margins. And like most students, I’d look at the grade, ignore the comments, and shove it in some forgotten corner of my locker. That frustrates teachers of course, who invest time into those comments. But if there’s no opportunity to respond to the comments — to fix the errors and improve the paper — then those comments do nothing more than remind me of my failure. This one-draft evaluation model doesn’t teach writing so much as critique writing. And it discourages writers more than it develops them. WriteAtHome projects, on the other hand, are completed in three drafts. That means students get two opportunities to make changes to their work using the feedback from their writing coaches. It’s during this collaboration that the real learning takes place. The instruction students get is relevant and meaningful because it can be immediately applied. And as students watch their papers improve from week to week, their confidence grows. Practice, response, and process. This is not a magic a formula nor some educational shortcut. It’s just common sense. 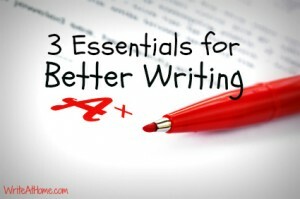 Writing skills develop with effort and instruction over time, and WriteAtHome is one way to be sure to get all three. It’s certainly true, Haifa, that some people are more naturally gifted than others in writing (as in just about everything). But I don’t agree that that “no one can master it unless you have some special talent.” I might work as hard as I can for years and I’ll still never be a Shakespeare or a Faulkner, but I can still “master” writing. Anyone willing to work at it can become a good writer.